Tome un carruaje tirado por caballos a las puertas y jardines de Marrakech en un recorrido botánico de 3 horas por la ciudad. Explore los vívidos jardines Majorelle, donde las paredes de añil son un dramático contraste con plantas tropicales cuidadas, piscinas tranquilas y bosques de bambú crujientes. Descubre las antiguas murallas con el tradicional 'barouche' y vislumbra las puertas extraordinarias que protegían a Marrakech de siglos de incursiones bereberes. Collected on time by a lovely driver. Taken to collect tour guide who we had to wait for. Had a short tour of Menara gardens. Not a lot to look at but interesting to see where the locals go. Guide answered all questions. Collected by driver and taken to The Majorelle Gardens which were beautiful and definitetly worth a visit. A safe haven of tranquility, but go early to avoid the crowds of Japanese tourists.The guide let as explore these gardens on our own and met us at the exit. We then had to wait for a particular horse and cart to arrive even though they were in abundance around the corner. Leave exit turn right and they are waiting on the next left From the guides phone calls i can only assume we were waiting for a friend of his! We did however enjoy the horse and carriage ride around the walls of the old town and taking in a bit of Marrakech life. Then the tour guide spoilt the tour by taking us to see more friends of his! A talk at a pharmacy where we were encouraged to buy and a visit to the rug shop where again we were taken to the show room and encouraged to buy! Even though the people we met were pleasant enough i booked a guide to STOP this kind of thing happening. Over all had an enjoyable morning but in hindsight would catch a cab to Majorelle gardens and get a horse and cart ride from around the corner back to town or hotel. 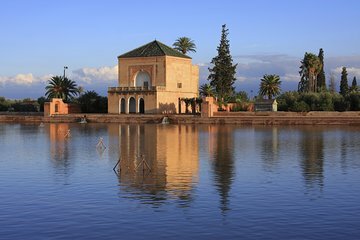 A lovely trip around the gardens of Marrakech although the the title you have given it is not strictly correct! The trip is in fact by taxi, with an hours carriage ride at the end. However, we enjoyed the experience and our guide was first class. The Majorele gardens are exceptional! !